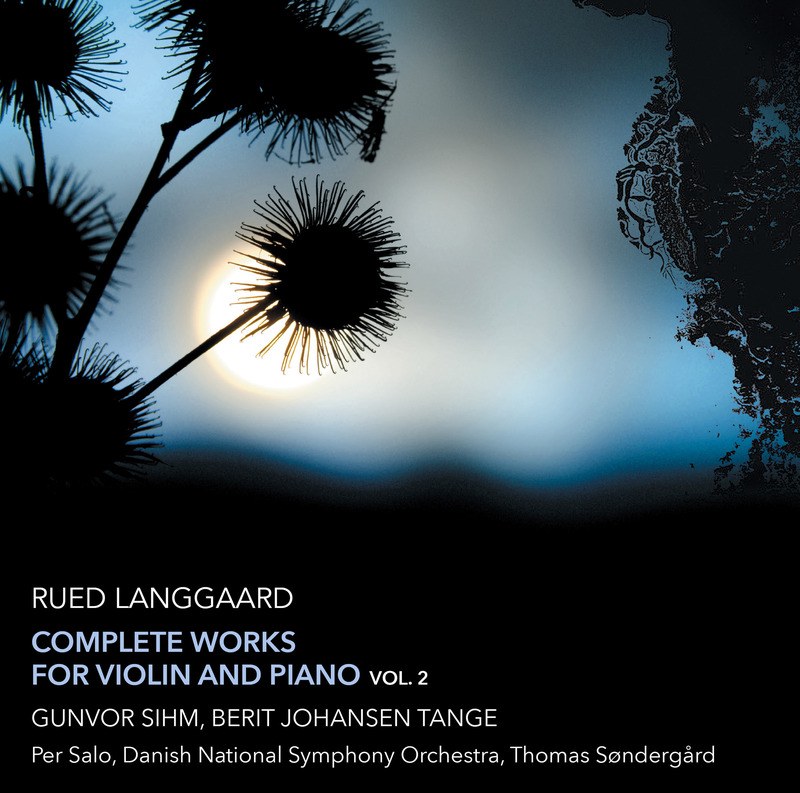 In this second in a series of three recordings presenting the complete works for violin and piano by Rued Langgaard (1893-1952), the award winning violinist Gunvor Sihm and the Langgaard expert Berit Johansen Tange perform the early and large Violin Sonata No. 1, composed in the course of four days in mid-June 1915. In addition, Sihm and Tange present Langgaard’s last work for violin, the Andante religioso, as well as the late Sunday Sonata, one of his most bizarre and unpredictable compositions. Rued Langgaard was born on 28 July 1893 in Copenhagen and died on 10 July 1952 in Ribe. Already as an 11-year-old boy he had a remarkable debut as an organist and organ improviser, and when he was nineteen his first symphony had its first performance in Berlin by the Berlin Philharmonic. In the early 1920s, Langgaard experienced a brief interest in his symphonic works in Germany, where his most progressive compositions, Music of the Spheres (1916-18) and Symphony No. 6 (1919-20) had their first performances. In Denmark, however, the music scene regarded the introverted and solitary soul-filled composer with considerable scepticism. An artistic breakthrough never came, and after Langgaard had had his opera Antichrist turned down by the Royal Danish Theatre, he reacted strongly by turning his back on modernism and openly criticising Danish musical life. Langgaard’s religiously and symbolically tinged conception of music accorded badly with the anti-Romantic, down-to-earth attitude that predominated in Denmark after 1930. Musical life followed the norms and the aesthetical track laid down by Carl Nielsen, and there was no room for an eccentric Romantic like Langgaard. After a struggle lasting many years to gain a position as organist within the Danish state church, in 1940 Langgaard was appointed cathedral organist in Ribe. After his death in 1952, it looked as if he would remain a parenthesis in Danish musical history. A performance of Music of the Spheres in 1968, however, started a renaissance for Langgaard’s music, and today, now that his main works are known, he is counted among the most important Danish composers of the 20th century. Rued Langgaard’s music is characterised by great stylistic variation. His works are often complex and unconventional in form and borne by a striving towards expressive, image-creating and visionary modes of expression. In his music there are elements that point forward to the 1960s and the avantgarde, minimalism and postmodernism of subsequent decades. Langgaard’s compositions for violin and piano are like fixed points in his production, since all four main phases of his musical development are represented within this genre. A sonata in three movements with the title Digtning – Rosengaarden in memoriam (Poetry – Rosengaarden in memoriam) (1918) would have been an interesting supplement, but the work has quite simply disappeared and must therefore be dispensed with in this collected recording of Langgaard’s compositions for violin and piano, which comprises three CDs. The early, incomplete sonata as well as the peculiar Sunday Sonata are being issued for the first time on a CD. Langgaard was taught the violin as a child, but only for a short while, for at the early age of ten he began to study the organ, which was to become his main instrument. The impulse to write music for the violin was, however, a completely natural one, as his aunt was married to the violinist Axel Gade (1860-1921), son of Niels W. Gade and for a long period the leader of the Royal Danish Orchestra – and incidentally also a composer. Langgaard’s first work for the violin, Aubade (1907), is dedicated to Axel Gade, who gave it its first performance. The first major chamber music work that Langgaard began after his grandiose B minor Symphony (No. 1) was a sonata for violin and piano (also in B minor), which he worked on between 1909-11. Only the first two movements were completed. They were performed separately in 1911 as independent pieces on their first performance by Axel Gade and the then 18-year-old composer. Four years later, Langgaard composed what was going to be his most comprehensive chamber music work, the 40-minute-long Violin Sonata No. 1. This work was composed in only four days in June 1915. Like the unfinished sonata and the almost contemporaneous String Quartet No. 1, in musical idiom and form it looks towards classical ideals. Sonata No. 1 was performed by Axel Gade in 1918 and was posthumously dedicated to him. But at the first performance in Stockholm, two years earlier, it featured the 25-year-old Danish violinist Gunna Breuning-Storm, with the composer of the same age at the piano. Breuning-Storm was one of the few musicians who appreciated Langgaard’s music, and it was naturally with her in mind that Langgaard, in 1920-21, wrote another sonata for violin and piano (No. 2). Breuning-Storm gave the sonata its first performance together with the composer in 1922 and played it a few more times during the 1920s, so for instance at an official Danish concert in Paris in 1923. Langgaard was not present, but Carl Nielsen – who also had a work included in the programme – was. In Sonata No. 2, Langgaard has clearly allowed himself to be inspired by Nielsen’s powerful musical idiom, which is however integrated into an experimental work in a single movement and with stark contrasts. The sonata, along with other works from 1920-24 – Symphony No. 6, the opera Antichrist and String Quartet No. 3 – is counted among Langgaard’s major works. It was published in Berlin in 1922. Almost 25 years were to pass before Langgaard contributed once more to the violin sonata genre. In the meantime he had drastically changed his musical idiom and adopted a neo-Romantic style of composition that was a continuation of compositions by such composers as Schumann, Wagner, Grieg and Niels W. Gade. In 1940, together with his wife Constance, he had moved from Copenhagen to Ribe to take up a post as organist and precentor at Ribe Cathedral. The 1930s had been a disheartening decade for the composer, and his composing had come to a halt. In Ribe his creativity returned, and in 1945 he wrote an extremely short violin sonata in one movement with nothing but repetitions, a work that in the following years was expanded time after time, until it had five movements and the title Sonata No. 3 in 1949. It is an example of Langgaard in a solely Romantic, nostalgic mood. But this work was succeeded by a whole series of new works for violin and piano, inspired by his collaboration with the violinist Håkon Raskmark, who came to Ribe in 1946 as a teacher at Ribe Teacher Training College. Langgaard and Rask-mark played together privately, especially Romantic sonatas such as those by César Franck and Schumann, whose late sonatas were clearly a source of inspiration to Langgaard. In the veritable ‘musical frenzy’ that seized Langgaard in 1947-49, he wrote 14 pieces or movements for violin and piano. They were composed individually or in pairs and partly placed in the already mentioned Sonata No. 3, partly grouped in Sonata No. 4 and in Écrasez l’infâme, both of which are key works in Langgaard’s late production. Added to these was Short Violin Sonata (1949), followed in 1950 by Andante religioso, which was performed in Ribe the same year. Apart from this piece, the works from the 1940s were not publicly performed during Langgaard’s lifetime. Sonata No. 3 only had its first performance as late as 1995, and at the Rued Langgaard Festival 2016 in Ribe it was possible for the first time to hear Sunday Sonata from 1949-50. The two first movements are for violin and piano, the last two for organ and orchestra. Only Aubade and Sonata No. 2 were published in Langgaard’s lifetime, the other violin works recorded here are based on the Rued Langgaard Edition’s critical musical material published in 2002-04. The BVN numbers used refer to Bent Viinholt Nielsen: Rued Langgaards Kompositioner. Annoteret værkfortegnelse. Rued Langgaard’s Compositions. An Annotated Catalogue of Works. With an English Introduction, Odense Universitetsforlag (1991). During the summer of 1915, Rued Langgaard spent two and a half months at Tyringe Bathing Sanatorium in Scania (Southern Sweden). Sonata No. 1 (E minor) was composed in the course of four days in mid-June, and before the month was over, a fair copy had been made. The sonata was given its first performance by Gunna Breuning-Storm and Langgaard in Stockholm on 17 January 1916. The feared Swedish music critic, the composer Wilhelm Peterson-Berger, wrote in his review in the daily newspaper Dagens Nyheter that the impression the work gave was somewhat unclear and uneven, although he pointed out that the 22-year-old composer naturally had a long future ahead of him. Two years later (on 7 January 1918), the work was presented in Denmark by Langgaard and his uncle, the Royal Danish Orchestra leader Axel Gade. This performance took place for a private audience at the Private Chamber Music Association. The sonata was not performed again in Langgaard’s lifetime, but the composer did not lose interest in this early work. In 1945, 30 years after its completion, he set about revising the composition. He left movements II and IV practically untouched, but thoroughly revised movements I and III, without, however, changing the actual form of the movements. At the same time, he posthumously dedicated the sonata to Axel Gade, who had died in 1921. In connection with the revision, the sonata was given the French word ’Viole’ as its title. It can be seen from the manuscripts that Langgaard had envisaged that the solo voice could alternatively be performed on a ‘viole’, by which he means a viola. But a viola is called ‘alto’ in French, whereas ‘viole’ means a ‘viol’, i.e. the Renaissance instrument viola da gamba. The misunderstanding is probably due to a dictionary error, since the available Danish-French dictionaries of the time erroneously translate ‘viole’ by ‘viola, bratsch’. Another thing is that it is not immediately feasible to perform the work on a piano and viola, even though Langgaard has evidently wished for a more sonorous sound in the solo instrument – in the first movement, at any rate, where long passages are written to be performed on the G and D strings. So, the title makes most sense if it is thought of as being a poetical title and a cadeau to the solo instrument. The work stays within the traditional framework of the sonata, and the musical idiom is retrospective. In the first movement, the violin enters with an unusually low, chromatic theme, played on the G string of the violin, that works its way upwards with more chromatics until it suddenly reaches a high point with quick, high scale-like movements. This contrast between low chromatics and high diatonics is the actual hub of the movement, while the chorale-like second subject (Più lento) plays a subordinate role (it is presented by the piano, accompanied by the violin!). In the development section (Agitato) a reminiscence of the second subject occurs, with the marking Lento glorioso. A distinctive, Langgaardean feature is to be found in the intermediate section of the scherzo movement, where a waltz motif gropes its way forward without ever getting off the mark. The slow third movement (G major) is improvisational and thoughtful in mood, which corresponds very well to the indication Lento cogitoso (thoughtful, mournful), although the movement was originally marked Lento molto e molto amoroso. The concluding, fiery finale is tonally more varied than the other movements but retains the E minor key. This is Langgaard’s last work for violin, composed on 6 September 1950. In actual fact, the composer prescribes violin accompanied by organ without pedals, but the accompaniment is of a piano-like nature, and the piece has often been performed with piano accompaniment. The composition was first performed in Ribe Cathedral on 17 December 1950 by Håkon Raskmark and Rued Langgaard (organ) at a Christmas concert where the star attraction was the Danish singer Aksel Schiøtz. Sunday Sonata is one of Langgaard’s most bizarre and unpredictable compositions. The work comprises three originally separate compositions: Sunday Sonata (movements I and II) for violin and piano, the organ piece Marble Church Prelude (movement III) and the so-called Small Grand Symphony No. 1 for orchestra with organ (movement IV). The three sections of the last-mentioned – a signal, an organ section and an orchestral piece – had the headings Curse, Angel Avenue and The lightning explodes in the night. In May 1950, Langgaard realised that he could create a more effective whole by combining the three works. With the addition of seven bars to movement II and the removal of the title to movement III and the headings mentioned in movement IV, Sunday Sonata came into being, with the subtitle Small Grand Symphony. Langgaard immediately sent the score to Danish Broadcasting Corporationas a programme suggestion. No notice of it was taken, however, and it was placed in the Radio music archive, where it was not localised until as late as 1988. The first performance took place during the Rued Langgaard Festival 2016 in Ribe Cathedral and featured Gunvor Sihm, Berit Johansen Tange, the cathedral organist Birgitte Ebert and the South Jutland Symphony Orchestra, conducted by Thomas Dausgaard. The first movement is a vigorous, freely formed sonata movement in F major that has a certain humorous touch. The slow second movement (A flat major) finally modulates into F -major, from where the organ takes over (movement III) and adds a church-like dimension to the established reverential mood. Movement IV begins with a fate-motif with an augmented fourth (tritonus) on brass and kettle-drums, after which the religious mood from movement III is continued on the organ. Suddenly, everything is shattered by the full orchestra (with 8 French horns) in 10 wildly gesticulating bars that contain a variant of the fate-motif, followed by glissandos (marked ‘as lightning’) in the deep strings (! ), an eight times repeated D on the brass instruments (perhaps imitating a bell) and a final D minor chord. Langgaard gave no indication of how the seemingly trustworthy title Sunday Sonata is to be understood with regard to the unusual form of the work and the chaotic conclusion. To Langgaard, lighting has an apocalyptic significance (As Lightning Cometh Christ Again is the title of one of Langgaard’s organ pieces), so it seems natural to interpret the work as portraying cataclysmic destruction, in which beauty, in a Romantic sense, is replaced by decline and disaster. But, like so many of Langgaard’s other late works, the work also has an ‘autobiographical’ dimension. The ending can be seen as a protest, a fist pounded on the table, where the composer expresses his powerlessness and displays the absurd situation in which he finds himself as an idealistic ‘cultural composer’ in a society that has no use for his music, and in which cultural life, in his opinion, has become impoverished and without inspiration.